Software program for production professionals responsible for estimating and managing the costs of any project. Helps you customize, create and edit comprehensive budgets for all types of productions. Produces a production budget that precisely demonstrates how your project will get made. Learn how to plan production costs and make a budget for a movie with Movie Magic Budgeting software! Whether you're working on an indie splatter flick or the latest studio blockbuster, you must be able to show investors a budget that demonstrates how you'll use their money to create a film, which is one reason why many professionals use movie budgeting software. 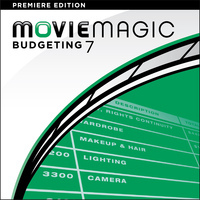 Movie Magic Budgeting 7 easily and accurately produces professional budgets for projects of any and all sizes. An innovative cost estimation tool used by production teams around the world, it features an intuitive format designed with an awareness of the complexities of production and the ever-changing issues facing finance professionals. Explicit levels of detail, multiple comparisons, and complete analysis of multiple scenarios are just a mouse click away with Movie Magic Budgeting 7. Intuitive Navigation - Move with ease through your budget with the redesigned Movie Magic Ball, or opt for Classic Movie Magic keystrokes. Multiple Budget Comparison - Compare and contrast possible budgets in just a few clicks to produce variance reports. Globals - Quickly change any aspect or variable and automatically update the entire budget. Fringes - Fringe by percentage or flat rate and add, calculate, and set-up fringe ranges and cutoffs with efficiency and ease. Groups - Plan for and track different scenarios within a single budget. 4th Level Spreadsheets - Breakdown an additional level of information and link it back into the Detail Account level. Credits - Apply credits for tax incentives, production rebates, or other credits directly to your topsheet. You can even add multiple credits and set cutoffs to cover complex spend requirements. Notes - Add Notes to lines of Details for creating Critical Assumptions or for tracking budget changes. Schedule Importing - Get a head start on your budget by importing your Movie Magic Scheduling 6 library. Bring over your elements and totals without having to re-enter your data. And much more! Movie Magic Budgeting 7 is the cost estimation program you’ve been waiting for! Use this film budgeting software today to increase efficiency and prepare budgets that allow your team to make the best production decisions possible. Pro Edition has 2 activations, Academic Edition has a single activation. System Requirements: Windows: 1 GHz processor. Windows 7 or higher. Mac: Intel Processor. Mac OS 10.9 or higher. Recommended: 1 GB RAM or higher. 200 MB Hard Disk Space. Minimum Display Resolution 1024x768. Internet Connection required to activate product. Please enter a serial number from a prior qualifying version. If you need assistance, contact one of our specialists.